Wild Plum Center currently provides two comprehensive preschool programs -- Head Start and non-Head Start funded, Head Start modeled Preschool. Wild Plum provides preschool services to low-income 3- and 4- year-olds. Service elements are intended to address any and all aspects of need within a child's life, allowing for more fruitful educational experiences. Wild Plum Center is committed to providing effective and efficient educational and developmental opportunities for its preschool students. 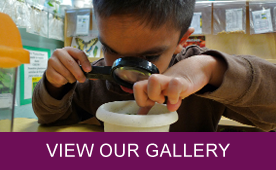 Currently, WPC uses the research-based Creative Curriculum in all 12 of its preschool classrooms. Creative Curriculum focuses on all areas of children's growth -- physical, cognitive, social/emotional, and language development. Creative Curriculum allows each teacher or Family Educator to incorporate and address the specific interests, characteristics, and needs of the children and families they work with. For more information on Creative Curriculum, please visit the Teaching Strategies website. MESA (Mathematics, Engineering, Science, and Achievement) brings hands-on math and science learning opportunities to Wild Plum Center's classrooms. During the early ages of 0 to 4, young brains are especially receptive to learning math and science. Knowing this, Wild Plum Center, in collaboration with Wild Plum Center parents, sought to bring the MESA program to the preschool setting. Through grant funding, Wild Plum Center was the first to make MESA available at the preschool level. In addition to enhancing each classroom with science and math- focused learning materials, Wild Plum has on-going partnerships with Fiske Planetarium, Denver Zoo and Denver Botanical Gardens. To learn more, visit the Colorado MESA website.